A one stop car rental booking platform, Carrentalworld offers an easy to use online form. Our alliance with leading rental brands such as, Hertz, Thrifty, Sixt, and Budget, allows us to get you quality deals at very affordable rates. Exclusive discounts, frugal deals, and a large rental car fleet, are few reasons to book a car with us. With our global association reaching to more than 500 suppliers, you get smoke free cars at more than 16,000 worldwide locations including, airports, train stations, capital cities, small towns, and leading hotels. One of the largest tourism destinations of North America, California is known for its extraordinary landmarks such as, the Golden Gate Bridge and Hollywood Sign. Home to five leading metropolitan regions, San Francisco Bay Area, Los Angeles Metropolitan Area, San Diego Metropolitan Area, Sacramento Metropolitan Area, and Riverside-San Bernardino Area, the Golden State offers plenty of worth seeing attractions ranging from exclusive shopping districts to large national parks. A famous tourism hotspot, Germany receives hundreds of thousands of visitors from all over the globe. Regions with highest every visitor count include – North Frisian Islands, East Frisian, Rhine Valley, Bavarian Alps, Black Forest, and the Baltic Sea coasts of Vorpommern, Mecklenburg, and Holstein. At, Carentalworld, we strive to get you best deals from our leading suppliers such as, Dollar thrifty, Advantage Rent a Car, Buchbinder, Europcar, Alamo, and Sixt. Our network of suppliers serves you at all major German locations, including metropolitan areas, national parks, train stations, and leading airports. A leading tourism destination in Southwestern Europe, Portugal is known for its renowned hotspots such as, Porto Santo Island, Lisbon, Madeira, Douro Valley, Alentejo, and Algarve. Besides exploring uncountable attractions, you can enjoy mouth watering Portuguese cuisine and rhythmic music that carries a great influence of different guitar genres. As its architecture also carries an influence of different civilizations, one can expect some of the best preserved masterpieces. 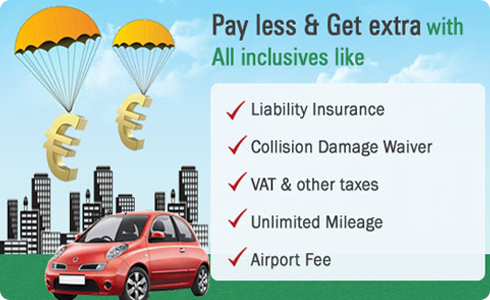 Avail incredibly value for money deals from Carrentalworld in just three steps! 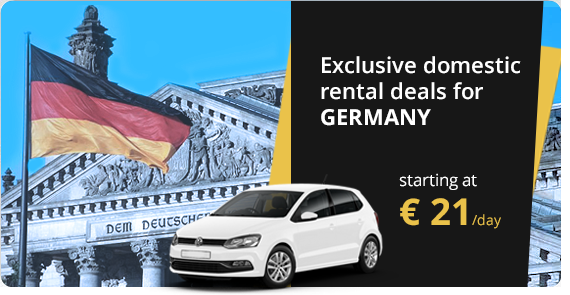 Get finest rental price as well as deals over 16000 worldwide locations, book with our online facility. All rental deals provided by us cover inclusives like CDW, theft protection and many more. We offer top class rental deals through a wide network of car rental brands. We offer a large fleet of cars, with an option of styles and sizes, fulfilling your requirements!